Do you have any old school related photos hidden in your attic ?? Class photos, plays, graduation ?? Scan them up and send them in !!! Most of these photos have been left large for identification of faces so this page may load slower than others (is that possible !!!) Enjoy ! MIss Raffel's 5th grade class at the East School. The play was James McNeil Whistler. The year was 1956. Ken Spooner sent this in and refused to identify his sister on the grounds she would kill him !!! But Ellen wrote me with the names, and promised there would be no violence !! (she aplogizes to those whose names she couldn't recall....) Thanks to Ellen (Spooner) Sherin for the identifications !! This is also East School. I believe it's a graduation picture (6th grade). Top row, left to right: Boy this is hard--- Marcie Laitman (I think), Fran Bauer, Me (Ken Spooner), Ellen Schatz, Jeff Sheldon, Martha Hinsch, Dan Breskin, Ann Rassiga, Hattie Graydon, Franklin Wepner (also known as Nilknarf Renpew). 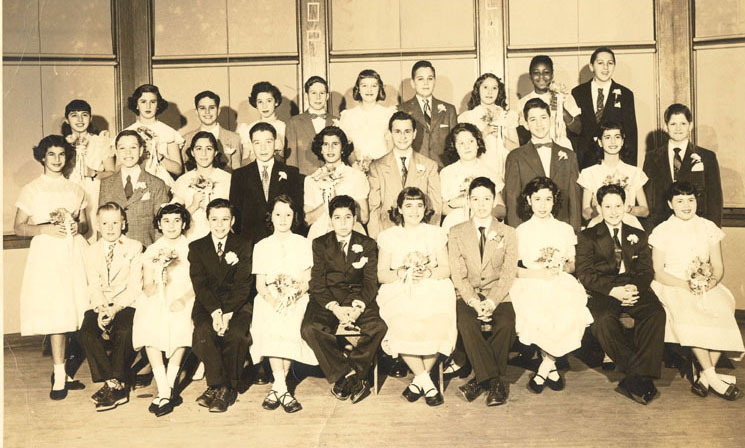 Middle row, left to right: Vivian Tseradski, Paul Reed, ? ?, ??,? ?, Les Pollins, ? ?, Stan Greenspan (MD today), Marcia Falcoff (my first date), Steve Goldberg. Bottom row, left to right: Kenny Bergen, Joan Kaufman, John Dieter, Bunny Leary, Jeff Becker, ? ?, Bobby Goldsmith, Loretta Reizman, Barry Merman, Carol Selby (I think). This is from East School. 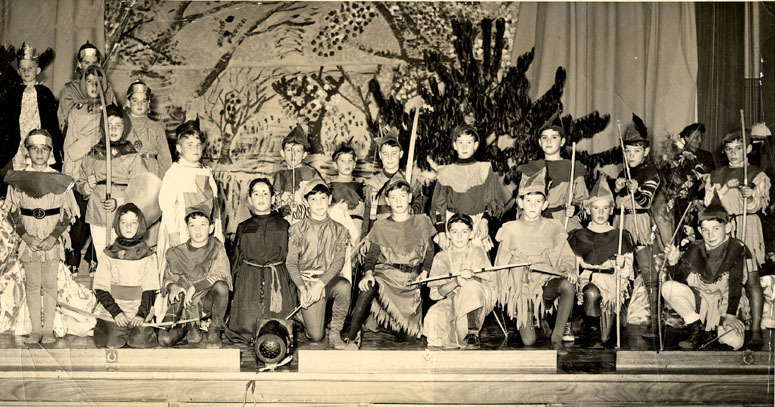 I guess about 5th grade from the play, Robin Hood. I can name a few: Top row, right to left: John Dieter, Paul Reed, Me (Ken Spooner), Jeff Sheldon. Don't know the next 3. Then Mike Offerman. Bottom row right is Alfred Zebrowski, Kenny Bergen. Third from left, Bobby Goldsmith. This would have been around 1951. *** I got a note on the guestbook from Peter LaSpina, who happens to be Friar Tuck in the above photo !! ( which, he says, is a 3rd grade photo) .. he left this note... "There I am in the front row dressed as Friar Tuck. Why the bandage wrapped around my head? I was the catcher without a helmet at a ball game a few days earlier and Bobby Goldsmith swung a grand slammer into my brow. So the script was changed and implied that one of Robin's arrows accidentally struck the good Friar.The show must go on, and I might add that that production began a lifelong affair with singing and the stage and I perform in regional theatre throughout Long Island and sing with 3 choirs. East School and Miss Hendrickson must have had a special emphasis on the performing arts...for me, I'll be ever grateful." 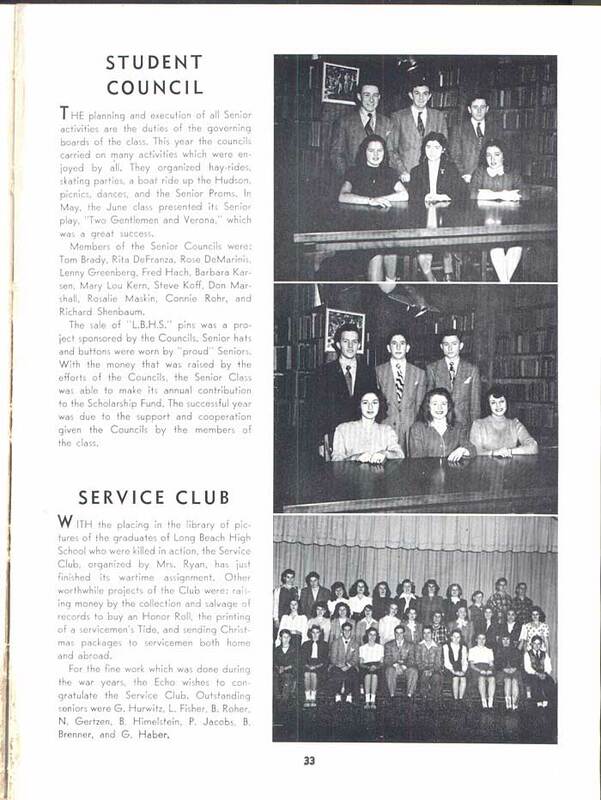 Click here for a page from the 1946 Year Book showing the student council ! !